Today’s wrap on the weekend’s racing has to do more than simply report results and provide insight on how races unfolded. Those details are certainly important and have been repeatedly shared over the past couple of days. For example, the fact that 47 year-old Matt Carpenter made what amounts to a definitive move on Daryn Parker at Barr Camp in the 2011 Pikes Peak Marathon is very important. Just as 41 year-old Dave Mackey’s course record at this year’s Where’s Waldo 100k shouldn’t be left-out of any worthwhile wrap on the racing we all witnessed this weekend. And what about the Leadville Trail 100? Wow. The Sandman struck gold up there in that old mining town. And a young gun who goes by DBow came in second. These results are important, too. But today, like most, Inside Trail wants to try and put some of this into perspective, propose a pattern or two we see developing across these great mountainous plains, of this country and beyond. But first, of course, there were some fantastic results this weekend put forth by some incredible athletes. On Saturday, the 5th race of the Skyrunner World Series got underway in downtown Manitou Springs, CO. What could have been a potentially epic battle between 29 year-old Mario Macias from Alamosa, CO and 24 year-old Glenn Randall of Mesa, CO became a one-man show due to Randall’s curious DNS. The ever-informative Pikes Peak message board sheds a little light on said DNS; the fact that Randall missed the entry declaration deadline (for even past winners) appears to have been too much for him to reconcile. Without getting caught-up in what’s appropriate or ethical here, we all just wish he had been more punctual with his declaration (for his own sake, for any critics of “preferential treatment,” and for all mountain running fans who would pay to see Randall and Macias battle 13.3 and 7800!). Tommy Manning, representing the U.S. mountain running team, finished 2nd in the Ascent in 2:15:43, and the ageless Simon Gutierrez, at 45, finished 3rdin 2:18:15. Macias’ 2:08:57 is exceptional, keeping record books conscious for the second year in row (after Randall’s 2010 2:09:28 ((at 23))). These superb back-to-back rookie Ascent times will hopefully give other talented Ascent virgins something to consider. It’s a world-class mountain running race, along with its big brother, the Sunday Marathon; it’s part of the Skyrunner World Series after all with years and years of mountain running lore to make this race tough to ignore. finished 14th and 19th, respectively. Spaniard Xavier Martinez, ranked as high as 4th in the world, finished 15th at 2:36, and finally, Spaniard Oscar Roig finished 11th at 2:33. Certainly, such lengthy travel takes a toll. Still, fans would be thrilled to see more of the top international athletes make their way to Pikes each August to test themselves ala the great Ricardo Meija from Mexico through out the 1990s (a quick glance at mid-2000 results reveals steady, resilient international competition in the marathon, often selected as a race in the Skyrunner World Series, as well). Maybe we’ll see the internationality of trail and mountain running (as seen at the American ultra especially) encourage more great mountain competition at Pikes Peak in the future. Kim Dobson, 27, provided adequate punctuation to Inside Trail’s women’s preview by submitting a near course record of 2:34:07; she did in fact set the 25-29 AG record. Sniffing Lynn Bjorklund’s 30 year-old record of 2:33:31 means the ground was definitely shaking in and around Manitou Springs on Saturday. Fantastic stuff, courtesy of Aurora, CO. Cynthia Arnold, of Glennwood Springs, CO was about 14 minutes back, and Nederland, CO’s Lisa Goldsmith (2:50:55) rounded out the women’s top three. There was indeed an upset in the women’s marathon as Joanna Masloski, 33, of Highlands Ranch (5:09:38), put too much space between her and Maria Petzold on the ascent for Petzold to catch her. Despite Petzold out-splitting Masloski on the descent (1:45:54 to 2:00:13), the 29 year-old from Eldorado Springs, CO came up a couple of minutes short (5:12:07). Andrea Williams, 30, also of Eldorado Springs, finished 3rd in 5:21:10.
becomes a little chilling when he says he couldn’t discern Carpenter’s breathing. Granted, a man is running up a steep hill at massive elevation and already has much anxiety and perhaps feels the onset of fatigue-induced hallucinations coming-on. But Carpenter is not breathing. This underscores my point about Carpenter in our Pikes Preview: his dominance, like his breathing on Sunday, may be surprisingly inconspicuous in that he could have been even more mind-bogglingly angelic on that mountain through the years had he had to work! Either way, the robotic Carpenter shuttled Parker to Barr Camp before making his aforementioned move that sealed Carpenter’s 12th marathon victory and his sixth in a row. And 48-year-old Bernie Boettcher of Silt, CO finished 3rd, again. This is getting complicated. More so to read about Carpenter’s weight concerns and how along with this (apparently dealing with some kidney concerns), his intense fear of (losing) and respect for the mountain almost kept him in bed Sunday morning. Let us truly appreciate what we have in this mammoth talent. Like Carpenter, and even Boettcher, another mountain (40+) Master went berserk on Sunday. Dave Mackey went up to the Waldo 100k and demoted Erik Skaggs’ CR by around 20 minutes, at 9:06. Second was a very talented Ian Sharman, 30, more than 30 minutes behind. To be continued. . .
to take complete control of the race after Winfield. Reports were consistent of his great form and team organization and execution. Only Bowman could really hang-on. But did he ever. Please take a look at the posts that followed our preview to see how nicely we tried to package this race. And read Tim’s race report for some depth into this one. Ryan Sandes (Capetown SA) 16:46:54, Dylan Bowman (Aspen CO) 17:18:59, and Neal Gorman (Washington DC) 17:48:51. Great performances by these guys and a host of others. Not to forget, the women’s race came down to some inspired running by Lynette Clemons, of Leadville, who managed an incredible 19:59:06 for the win and 10th overall. Rhonda Claridge (21:11:24) and Andrea Metz (21:13:14) rounded-out the top 3. 622 started the 2011 Leadville Trail 100 but only 340 finished, and of those finishers only 92 went sub-25 hours to earn their big buckles. Sounds like a blast! 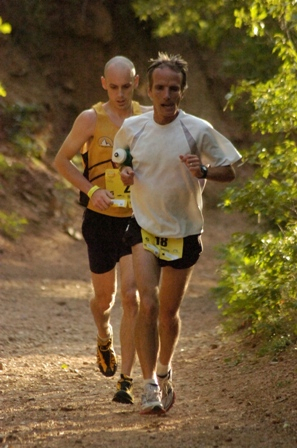 One footnote on the weekend, offering a tiny tip of an iceberg for the following discussion: in the Pikes Peak Ascent, one Chuck Smead, 60, of Mosca, CO, he of some American mountain running glory days, finished 48th and set the age group CR with a terrific 2:58. Apparently, as passed along by a fellow bus rider on the ride back to town, the next Chuck Smead Pikes Peak sighting will be in about 5 years, with another CR in mind. And in Leadville, Charles Corfield, 53, of Los Altos, CA finished 8th overall in 19:09:32. Awesome! Two final points need introduction here. We are in a golden age of mountain running (hopefully every generation is lucky enough to say that). Matt Carpenter is arguably the greatest ever. And he deserves much more “ink” here at Inside Trail. His accomplishments at Pikes are incredible. 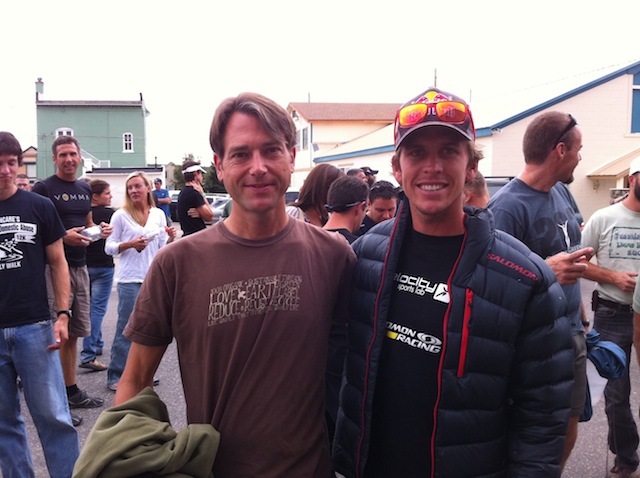 Speaking of Leadville, the day his CR is taken-down will be a very very special day in trail ultra history. There are too many more records and races and race anecdotes to cover here, now. We need to appreciate that kind of a competitor. Dave Mackey is another genuine trail genius. As fans we have to glorify this kind of trail career. He has many more gem performances up his sleeve, but this guy is just plain remarkable. What we would have given to seem him toe the line with Carpenter again at the Pikes Peak Marathon last Sunday. Hmmm. Great stuff. (Not to be outdone, the great Jonathan Wyatt continued his comeback from injury ((and dealing with age)) back on August 13 at the steep ascent of Skaala; his lovely wife won the women’s race. 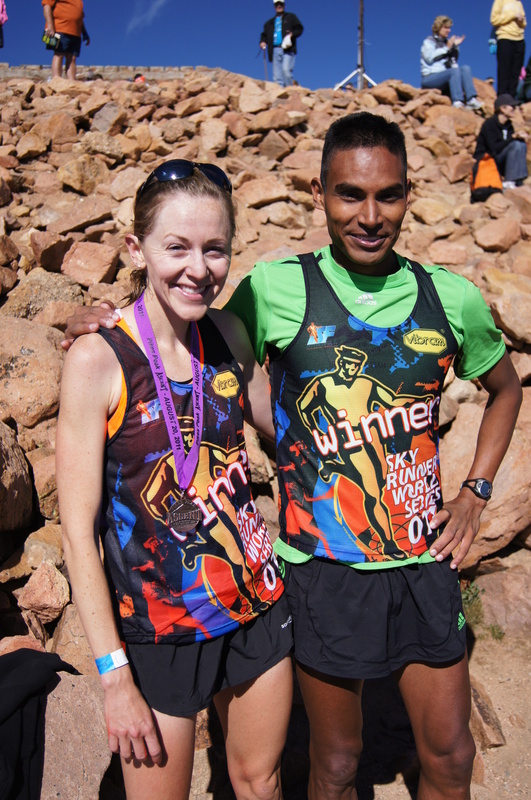 These are a couple of great runners, competing just this past weekend, at the highest level. Naturally, we need to ask two important questions. How much longer will they compete like this, especially Carpenter? Secondly, who is the next Matt Carpenter or Dave Mackey? By this we mean when will an American dominate at such lengths, at so many different venues, for so many years? The second question leads us to consider what is happening in American ultra or trail racing today. We know what the summer of 2011 has become. Short of Geoff Roes, Mike Wolfe, or Dakota Jones, et al., doing something incredible overseas next weekend at the UTMB, the non-American ultra runners have clearly laid claim to some very big ultra prizes (what does this do to the UROY award?). And no we are not trying to encourage some of kind of culture war or accentuated regionalism, or whatever else might come to mind. Competitive sport is that: competitive. And international play taps this kind of alliance or allegiance that generally comes pretty naturally to the competitive spirit. Just ask those international athletes. Lastly, we are not falling for the high-road here. “Fine if those countries want to battle it out; we’re just here for the fun.” What? Salomon Running has utterly dominated a lot of racing recently. Let me charter a few names to take-in the scenery: Miguel Heras, Kilian Jornet, Julien Chorier, Ryan Sandes (NF50 San Fran, WS100, HR100, LT100). I am not going to leave-out Rickey Gates and his phenomenal Mt. Washington win (nor the team’s elder statesman, Jono Wyatt). The sense we have is that this is a team that means business; and make no mistake: we are not talking about selling shoes. Salomon is bigger than shoes and so are these wins by a team that is very committed to cleaning-up, bullying the respective fields at whatever races they target. “Wait. It’s only one year, this pattern of Salomon dominance.” True. But the way it’s been handed-out seems strikingly clinical, even industrial. Each “assignment” is delegated, seemingly, to only one highly trained “operative.” Who is pacing these respective winners to their respective victories? 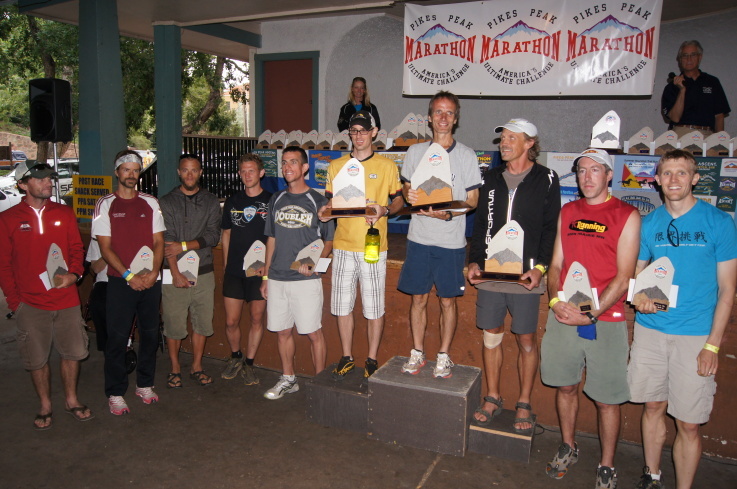 Gates, et al., at WS100; Sandes, et al., at HR100; and Anna Frost, et al., at LT100. The teamwork is sensational. The execution is marketing genius. And what are they marketing? Indeed, here’s the last question: why? Why such a concerted effort to dominate? Coincidence? To sell red shoes? A competitive cycle that happens from time to time? Or this the beginning of something else of which the Americans, or at least other running brands might want to take note? All we know is it’s happening. Competitively, these patterns (an aging, perhaps less focused American contingent and a European team/brand dominance) convey. Ignoring them certainly is no fun. Sadly (but understandedly), it sounds like Matt is starting to move away from every-year running. If he does skip a year or two, hopefully at least he’ll still show up at 50, 55, 60, etc. to set age group records. Even more than his 2:01 ascent record…what of the 3:16 round trip? I mean NOBODY broke 4 hours other than Matt this weekend, and nobody other than Matt broke 1:30 on the descent. If you run a 1:30 descent, you’d have to ascend in 1:46 to break the marathon record. Not. Gonna. Happen. Keith Wood set a new age group record in the Ascent at the age of 82, but apparently missed the cutoff at A-Frame in Day 2 to try and Double (he successfully doubled at age 81 last year). Nobody age 82 or beyond has ever finished the marathon…hopefully he’ll be back next year. I don’t know many 82 year olds. I don’t know any that run. So running a marathon up a mountain at altitude the day after running up a mountain at altitude is awe inspiring. Great write up. The synopsis at the end is spot on and may be indicative of a dramatic paradigm shift in ultrarunning. Excellent. Happy (and relieved) that we’re partners in this (IT) endeavor. As we’ve discussed at length, you spotlight the “clinical”, hell, surgical nature of the manner in which Salomon has dominated in a chain-reaction effect. One athlete helps the other achieve his goal, while he in turn is benefitted by his domestique duties, propelling him to victory in his own future event with the assistance of another team member. Wash, rinse, repeat. It seems to be planning genius. Again, excellent, Matt. Excellent write-up. I most appreciated the provocative questions and theories at the end. I think your assessment of Salomon’s approach is spot on. Their strategy certainly appears to work and may prod other teams/companies to adopt a similar approach. Perhaps we will see something like what has developed in road cycling where teams/sponsors play such a critical role and add a level of competition and excitement (not only are you cheering for an individual but often for an entire team). I think this could be good for the sport (more resources, heightened competition, more attention, more competitive athletes, etc.). My only fear is that we might lose the fringe ethos, the camaraderie, and focus on the pureness of running in the mountains. That kind of world is entirely different than what has existed in mountain running to date (at least in the USA). However, it may be the natural progression of things. I am definitely interested in reading what others think about this. I think if there is a difference in quality between US and foreign ultra runners (which there is — though it isn’t that dramatic) it can be attributed to the fact that Salomon appears to be nurturing its best ultrarunners to be professionals, whereas US sponsors haven’t provided funding for ours to do the same. Kilian Jornet puts in 35 hours a week in training. That, plus recovery, is a full-time job. Our best guys go to school and have jobs. If Bowman, Dakota, Krupicka, Roes, and Clark had the resources to dedicate themselves full time to the sport, then our best runners would be able to compete with Salomon’s. But when one group has to work to support themselves and the other can focus exclusively on training and recovery, US victories will be the exception in true world-class events, rather than the rule. Thanks for the comment, Kieran! Just off the top of my head, I know Miguel Heras and Julien Chorier work full-time and both have families. I’m not sure you can say that all our top guys work full-time. Students, part-time cooks, etc leave a lot of time to train. When Anton’s healthy he’s putting in close to 25 hours+ per week of running. I get what your saying, in terms of support but I think at least a couple of our teams are putting in as much as Salomon. Pearl and, especially, La Sportiva come to mind. I think the strategy and planning of athletes’ race schedules is a big part of Salomon’s advantage. Whatever they’re doing, it’s working. It’s not necessarily a cultural angle we’re prodding. It just so happens that Salomon’s team is mostly built of athletes from other countries. And they are winning the big events. UTMB will be interesting, to say the least. Thanks again for your comment. Always appreciated. I hear you on this and I agree that Salomon provides a ton of support for their athletes and the Euro runners in general are supported more than US runners and that this is a significant factor. However, several of the top Salomon runners also hold down jobs and/or go to school. This includes Julien Chorier who holds down a job and was this year’s HR100 champ. Kilian’s profile also indicates that he is attending school however, I am not sure that is up-to-date as I don’t know how he could pull that off. I write all of this in order to give the Euro and Salomon runners their due but more importantly because I think their winning has less to do with them having or not having other obligations and more to do with their strategy and approach to running as an actual team. I also feel that the top US runners can and do compete with the best Euro runners. However, if they were supported by a team like Salomon they (the US runners) would be even more successful. Good stuff, Brett. I hope he “hangs around” the mountain in years to come, too, shattering AG records along the way. I don’t know if you caught wind of the health (kidney?) issues he might be dealing with. Man, I sure hope it’s just passing and doesn’t affect his running or his day-to-day quality of life. More Carpenter! And I’m stoked you guys are interested in this Salomon topic. We’ll definitely be following this must-see trail racing development. By the way, there will be more discussion in the coming days as we reach-out to some industry types for more insight. Great job with Inside Trails guys. Somehow, in the just a few short weeks, you’ve managed to leap frog the other on-line trail/ultra resources with high quality coverage, interviews and analysis. I’m not sure how you’re managing it, but keep up the good work! Also, FYI, Rhonda Claridge was 2nd women at LT100 this year in 21:11:24. Thanks so much for the kind words, Jim! We’re just getting rolling and have a lot of enthusiasm and ideas in store. You better believe I at least know Rhonda was 2nd lady; she and I were running near one another from mile 60 to the finish. My neck’s still sore from looking over my shoulder for her over the last 5 miles! Great to hear, Jim. Thanks for the feedback. Stay-tuned for more. And keep the feedback coming. That’s how we stay fore-foot (on our toes)! Definitely saw Keith up high on the second day, but below A frame. Assuming he did not make the cut off. For the record, there are other solid “teams” represented by very talented athletes competing throughout the year at various trail/mountain/ultra races. Pearl Izumi and The North Face come to mind. These two along with Salomon will be battling it out this weekend at the UTMB. What’s remarkable is the success that Salomon has had; with its very deep roster, this team looks quite formidable, sending relatively “fresh” legs to races throughout the year. As with any big jump in performance, an industry/field usually responds. Let’s hope this happens in elite mountain running. Maybe I’m Johnny-come-lately but I just “discovered” Inside Trail and it is without question an invaluable resource for following ultrarunning and synthesizing what’s going on. The analysis of Team Salomon was incredibly insightful and at once kind of breath-taking. It’s breath-taking because one has to wonder what their (Team Salomon’s) angle is. It’s kind of like being invaded without warning and then finally when the doors have been broken down you’re left wondering how the invaders got in and what they want. Only it’s too late to have stopped them. Or is it? Anyway, Inside Trail is JUST what we’ve needed for a few years now–a go-to resource for putting it all together and getting some perspective. Good work, Tim, Matt et al. A word on Team Salomon–not sure what the response will be. Unfortunately, only dollars and cents will dictate if there is even a response. Companies like La Sportiva, Pearl Izumi and Montrail will make a charge only if they stand to increase their market share, sales, etc. Maybe I’m being pessimistic here.